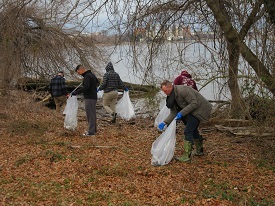 The Notre Dame Club of Washington, D.C. helped clean up trash along the George Washington Memorial Parkway north of Dyke Marsh. In contrast to many who apparently don’t care about trashing our natural resources, as evidenced by the endless trash along the shoreline and in the marsh, many people do care. 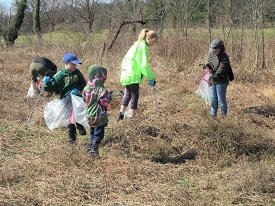 On March 16, 25 members and young members-to-be of the Notre Dame Club of Washington, D.C., helped clean up trash along the west side of the George Washington Memorial Parkway north of Dyke Marsh. 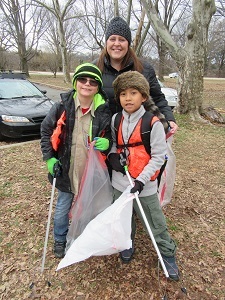 Gavin Thompson, mom Jennifer Thompson and Enzo Lukban all pitched in to help clean up.Volunteers collected seven bags of bottles, cans and other debris in 30 minutes and later many more. 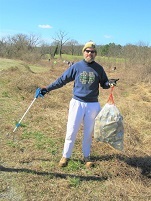 Kevin Shers (blue jacket) brought in the seventh bag. Colin O’Neil (navy blue sweatshirt, yellow hat) organized the group. We saw bald eagles perched over the golf course and newly-returned ospreys soared overhead as crows squawked. 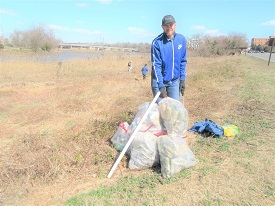 On March 9, 45 eager volunteers of all ages tackled trash on the east side of the parkway along the shoreline. Gavin Thompson (and mom, Jennifer) and Enzo Lukban (Davey Crockett hat, photo right) were rarin' to go! The Air Force Honor Guard based at Joint Base Anacostia-Bolling sent eight hardy fellows. Cub Scout Pack 658, based at the Mount Vernon United Methodist Church, sent an "army" of youngsters and parents. 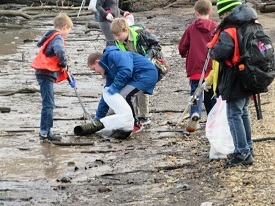 Volunteers hauled in plastic bottles, bottle caps, aluminum cans, plastic straws and some took on the zillion pieces of styrofoam and cigarette butts. 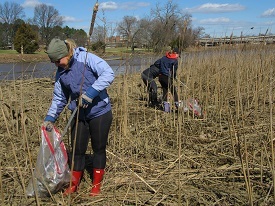 The Friends of Dyke Marsh partnered with these groups and the National Park Service provided supplies and supported us all. Trudy Roth (park ranger uniform) was our National Park Service leader extraordinaire. Photos contributed by Glenda Booth. 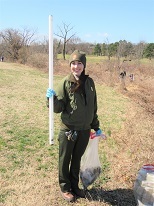 Friends of Dyke Marsh, Inc. is a non-profit 501(c)(3) organization. © 2019 Friends of Dyke Marsh, Inc. All rights reserved.